Ammu hands me her small journal and a purple gel pen. I take it from her with a smile, my mind racing with possibilities of what I can write. It has been ages since I literally put pen to paper. I debate between a pulli kolam (design by dots), a letter to her or a bucket list of sorts. It was serendipitous that Saathi and I were discussing what I had written about being in my fortieth year. The pen hovered over the paper for a few seconds before developing a mind of its own and jotting down a list. Reading the list aloud to my daughters, I realized a lot of them had to do with travel or experiences. Then there was the list of things I wanted to add but demurred like getting drunk or wearing a swimsuit. I snapped a picture of the list for my records and before I knew it, Laddu had it crumpled in a ball in her hands. I watched the list roll on the floor and become a ball to play with. Later that night, after the kids were in bed and I was picking up toys, I found it under the table. I spread it open and straightened the creases. I put it away in my drawer, a reminder of the things I wanted to do. Perhaps it was giving voice to the wish list, the very next day saw me sitting in the shower scrupulously shaving for a day out in a park that had water rides. Getting ready to go, I slipped my swimsuit in, feeling very self-conscious as I did. I don’t know if I will wear it, I said aloud, convincing myself that I had it just in case. The day sped quickly as the girls and I tried ride after ride. Saathi and Laddu joined us for a few. In another first, I got on the merry-go-round with the girls and on impulse climbed on one of the horses beside Ammu. I held on tight and as the ride got faster smiled so wide that I felt my face would crack. There is truly a joy in letting that child in me out. I galloped and grinned all the way. We passed a ride inventively titled ‘A Kite Ride’. I stopped, watching in awe as kids and adults alike scrambled on what seemed like pallets, face down. I watched in amazement as the ride started and the arms spread out gradually mimicking flight. “Who wants to go with me?” I ask. The girls run behind their dad shaking their heads no as they make a beeline for a giant slide. I begin to follow them and then turn back and join the queue for the airborne ride. I scramble on the pallet, feeling conscious again. “Am I lying right?” I ask the ride operator. “You are fine!” she dismisses my concern and bolts the lock in place. I look down at the seal coated floor and wait for the ride to start. Start it does and I spin around and around losing a sense of time and space. At some point I close my eyes and imagine I am flying. A few minutes later, I am running behind the kids as they make their way to a roller coaster that combines two splashes. We scream and howl in glee as the log boat skims through the water gathering momentum from our drop. We try the sky ride, the bumper cars before we make our way for a snack break. We devour ice-creams and scan the skies as huge drops of water fall from the skies. We hurry to the water rides section as the rain ceases. I scan the few people around me. No one is in swim suits. The kids are raring to go. I make my way to the changing rooms, get them changed and debate if I want to try the swimsuit on. After waffling, I remember my bucket list, take a deep breath and change. I walk out much too conscious of myself. Saathi looks appreciatively. I let out the breath I am holding. “Mommy, I like what you are wearing.” pipes up Pattu. I hold hands with her and we walk up to the entrance. The lady shakes her head seeing us. “Rides are closed owing to inclement weather” she says. “But the rain has stopped.” we say. She asks us to take it up with the front office. I feel let down. I haul the kids to change them and we troop out long faces and all. Saathi in the meanwhile triumphantly calls from guest services. He has scored a free all day pass for each us valid till the end of the year. The smiles are back on and we head home. I strike two firsts off my bucket list. In doing so, I realize perhaps I should work towards the rest. Next The Huffington Post Woohoo! May you strike out more on that list :). I was thinking what I would have on my list. I realised I want basics – a home. Nothing else 🙂 I also realise I would probably never strike that one off and am growing to be ok with it. No choice!! Dunno da. Just got a reject from a writing program I applied to. It stings. The thing about these lists are that there is no expiry date. So who knows. It may happen for both of us yet. 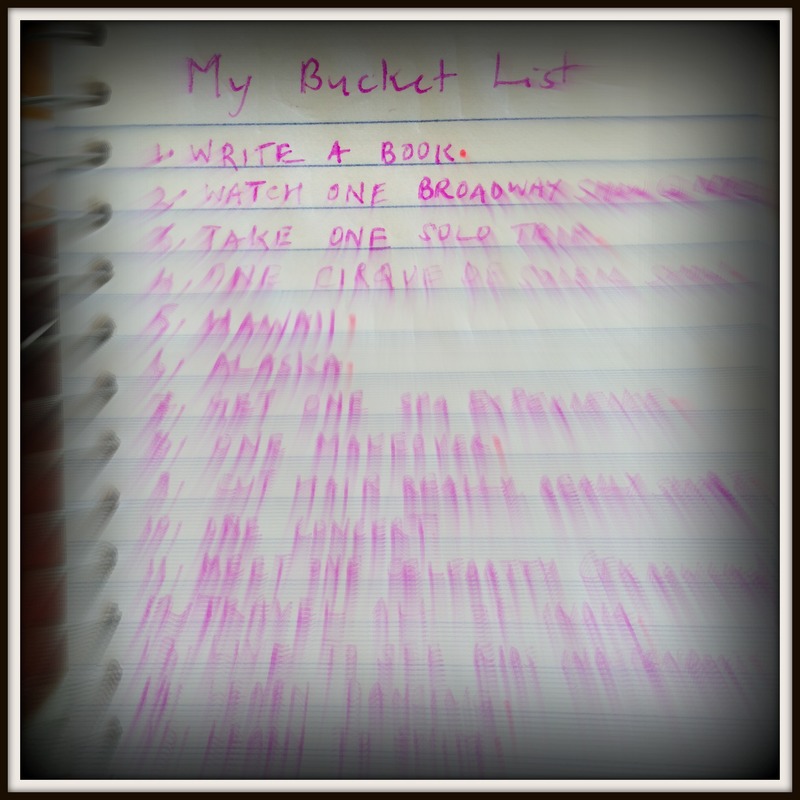 A list has been on my mind too – not a bucket list, but a list of things I want to be doing when I kick the bucket. Dr. Kalam effect, I think. I blog post is definitely brewing…. Talking of rejection – I saw a pointer on my google plus, but couldn’t find the post here. Assuming you removed it. Did you know Kalam aspired to be an airforce pilot but was rejected, and went on to rule the country? May you try every point on that list of yours…its ok if you don’t get to splash around in the water, what’s more important is that you wear that suit. Absolutely LG! I removed the post as I felt much better yest evening. I should have put more effort into the application.